Over the next few weeks, I have several bread/baking recipes to share with you, including 100% whole wheat sourdough bread, soaked bagels, and sourdough rolls. In order to make those recipes, you’ll need a few tools. Because recently I’ve been asked to recommend what tools/items a home baker should own in order to successfully bake bread, I figured I should share this list with you! Loaf pans (if you want to make sandwich bread): I love these loaf pans . I have three because I consider it a waste of my time to make less than 3 loaves of bread at a time. I also love these mini loaf pans . Ellie regularly uses one to make her own loaf of bread and it’s so cute! A scale: Technically not required, but you’ll need one if you want to follow my bread recipes! If you’re going to start making bread consistently, then it’s totally worth it to buy a scale. Many, if not most, bread recipes (including mine) will give you measurements in weights (rather than volume) and I can’t even describe how much much easier it is. I am constantly saying to Nik how much I love baking by weight. I guess a scale is optional but it’s totally worth the investment in my opinion. The OXO scale is the one I have and I see it recommended everywhere. I’ve been using it constantly for close to five years and have no complaints. A rolling pin: I have this solid maple rolling pin and I love it. It’s much easier to use than the kind with handles. If you want one slightly lighter, then go for this one with tapered ends . Plus, they’re hand-made in Vermont! Cooling rack: This cooling rack is nice because it can fit inside of a half-sheet pan. A big cutting board: I use a large cutting board for rolling out my bread dough (when making sandwich bread and bagels) as well as for portioning dough into rolls. You can also just flour your table but I like having a surface that I know is clean! It’s also useful for slicing your bread once it’s cooled. The two that I have are great. One is a gorgeous one from an Etsy shop that is sadly now closed and the other was a wedding present. Not being able to link to mine, here are a couple options that should be good (as recommended by Cooks Illustrated): one plastic and one wood . 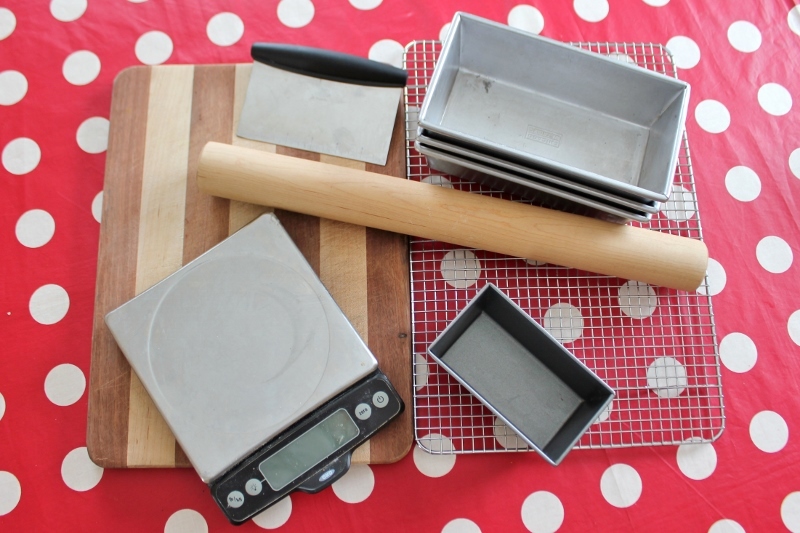 A scraper/chopper: This OXO scraper is an inexpensive tool that is really helpful for portioning dough into rolls and for scraping off sticky dough. A stand mixer: It is certainly possible to knead your bread by hand but having a stand mixer makes life infinitely easier. 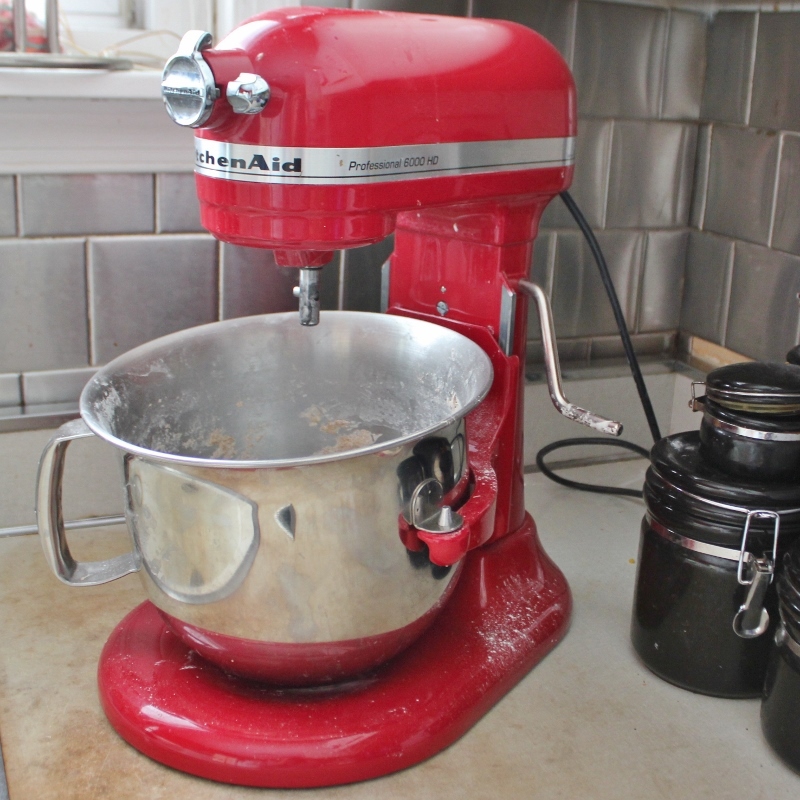 I have a KitchenAid – the six quart professional series . I used an Artisan KitchenAid for several years. Around 18 months ago, I finally admitted that I had outgrown that one and needed a stronger motor and a larger capacity mixing bowl. I’m grateful for my bigger KA every time I make bread. The price difference between the two is often less than $100 so if you’re going to buy a new one, it’s certainly worth buying the larger professional series. Haunt Craigslist and yard sales too – you might get lucky. And put it on your Christmas wish list! Now go make some bread! This entry was posted in baking and tagged baking, equipment list, home baker, recommendations. Bookmark the permalink. Thanks Wanda! So nice to hear from you! I will be interested to see your recipes. I don’t really enjoy the sourness of sour-dough breads, so when I make my own I have used decent quality ingredients but a more mainstream recipe. I sense that many folks believe the sour doughs are easier to digest…If you have any experience on how to tweak a recipe to promote digestion without creating such a strong sour taste, I’d be very interested. Sorry to take so long to get back to you, Liz. Soaking rather than sourdough is definitely what you’ll want to do. Try this recipe for starters. Yours is such a good question, I’ll probably just answer it more fully in a post of its own. Thanks!